For some business owners it’s Christmas all year. Such is the case at Tis the Season. Photo by Len Villano. It’s the most wonderful time of the year. For most, that phrase is synonymous with the month of December and the days and weeks leading up to Christmas, but some niche retailers infuse their daily lives — and those of their loyal customers — with holiday merriment all year long. Besides being the most popular U.S. holiday — with upwards of 90 percent of citizens celebrating, according to the Pew Research Center — Christmas also anchors the season with the highest consumer spending. The tradition of Yuletide gift giving accounts for the majority of holiday purchases, but the amount invested in home decorations, Christmas trees, parties and annual traditions such as baking and attending seasonal performances also makes a big impact. Consumers’ investment in the spirit of the holiday season allows an entire industry to conduct business all year round. The purple Christmas Tree at ‘Tis the Season in Egg Harbor. Photo by Len Villano. It’s not often that a conversation over pizza and beer leads to the purchase of a holiday store, but that’s exactly what happened to Steve and Maggie Young. Living and working in Appleton, one hour south of Door County, they spent numerous years vacationing at The Rushes on Kangaroo Lake, dreaming of eventually retiring in the area. Their annual trips included shopping in Egg Harbor and making a visit to their favorite holiday shop, ’Tis the Season, which was then owned by Tom and Sheri Conley. While vacationing during the summer of 2012, Steve and Maggie learned that ’Tis the Season was on the way to closing its doors due to the impending retirement of the Conleys. They were sad that their annual shopping tradition in Egg Harbor would be forever changed. Not wanting to accept this new reality, they had to ask themselves: what if we were to become the new owners? They pondered the idea over a pitcher of beer and a pizza, and by the last slice, they had a plan to take the leap. Without a background in retail — much less the subspecialty of holiday-focused retail — they negotiated the purchase to include support and guidance from the Conleys to supplement the insider knowledge they were about to gain. During the first season of transition, both Steve and Maggie kept their jobs in Appleton and split time staffing the store with Tom and Sheri. With the help of the Conleys, they attended their first Christmas market, where they navigated the eye-popping selection of new products to sell for the coming year. Since then, the couple has made the shop their own, relishing the challenge of predicting each year’s hot sellers. The specialty item that has become the Youngs’ signature is the annual Egg Harbor egg ornament. Each year Steve and Maggie choose three iconic locations in the village to photograph and feature in artist-painted renditions that decorate the exterior of actual eggshells. Complete with a loop for hanging, these egg ornaments have become a collectible to loyal shoppers. This year the egg highlights the new Kress Pavilion, the glistening blue tree that’s an art installation in front of Main Street Market and the Lull-Abi Inn. 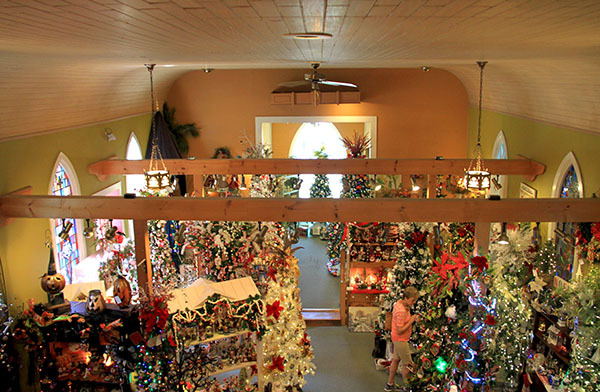 The view from above inside the Tannenbaum Holiday Shop in Sister Bay. Photo by Len Villano. Located on the north end of Sister Bay is Tannenbaum Holiday Shop, housed in a beautiful building that was originally built in 1879 to be a Lutheran church. On a sunny summer day, the sun shines through the stained-glass windows and down upon the glistening and twinkling displays of holiday décor. Walking through the former church, you can sense the sentimentality that customers return for year after year — Tannenbaum has a magical way of turning a shopping trip into a lifelong memory. Ron and Sue Flittner have witnessed this phenomenon frequently during their 14 years of owning the shop, and it’s one of the reasons they were drawn to the holiday business in the first place. The Flittners bought the store in 2004 after they had been living in Wisconsin for several years. Ron’s career had brought them to the area, and when his employer requested a relocation, the couple took action to stay put instead. With Ron’s extensive background in business management and Sue’s experience as a retail buyer, they decided they had the business skills required to own and operate Tannenbaum. Outside of the business skills, they also harbored a passion for holiday decorating, which has always been a big part of the Flittners’ family traditions. 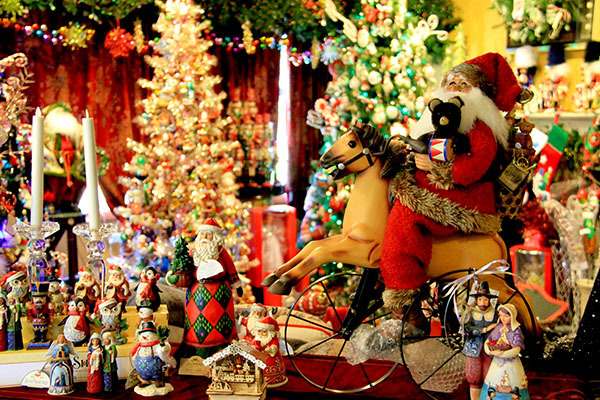 Sue admits she’s a decorating fanatic — for Christmas, but also for other holidays such as Easter, Halloween, Thanksgiving and Independence Day. She relishes the tradition of decorating because for her, holidays are times to bring your family together, reflect on years past and savor the time you have together in the present. “When we get out the ornaments and decorations every year, it’s like unwrapping our cherished memories,” she said. Now, as full-time residents of Sister Bay and involved business owners, the Flittners are able to provide a very happy place for their fans. “Many returning customers have really become our friends over the years. We even know when to expect them each year,” said Sue. 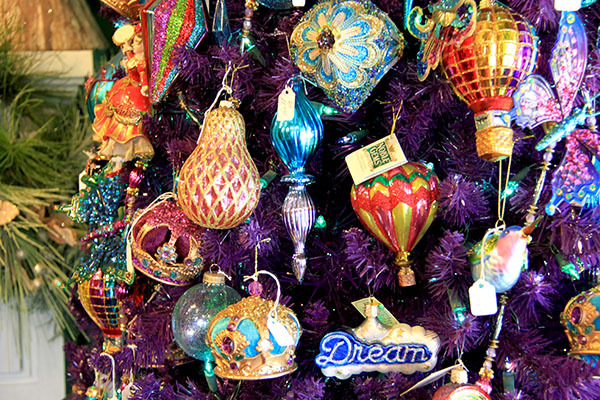 Many visitors make a special annual trip to select their holiday ornaments and pick out gifts; others are vacationers who choose an ornament to commemorate their family’s time in Door County. Mistletoe Holiday Shop is located a few miles south of Egg Harbor. Photo by Len Villano. Driving south out of Egg Harbor, you’ll come upon a festive, red-and-green sign that reads “Mistletoe Holiday House,” with an arrow pointing down a road named Holiday Drive. Don’t be fooled by the quaint, gingerbread storefront, for inside the red front door you’ll discover a forest of Christmas trees. You half expect to find Santa’s helpers among the evergreens, but instead you’ll find one of two friendly folks who may as well be honorary elves for the amount of spirited effort that they’ve invested in this cozy holiday shop. One is Heidi Meyer, daughter of the original owners, Jan and Dan Lautenbach. The Lautenbachs built and opened the store in 1992, continuing the Christmas traditions that were entwined with their family’s heritage. Jan’s great-great-grandfather lived on an Austrian farm owned by Franz Gruber, the composer of the beloved Christmas song “Silent Night.” Her ancestors were also part of the Strasser Family Singers, who popularized the song to worldwide recognition. Sue had heard the news that the original owners wanted to retire, and she saw an opportunity to turn her favorite shopping spot into her own business. The Lautenbachs couldn’t have been happier to put Mistletoe into the hands of a loyal customer who found the same joy in Christmas that they did. Since then, Sue — Mistletoe’s second honorary elf — has worked with Heidi to continue the traditions of offering an astounding array of unusual and tantalizing ornaments as well as free name customization on those ornaments. 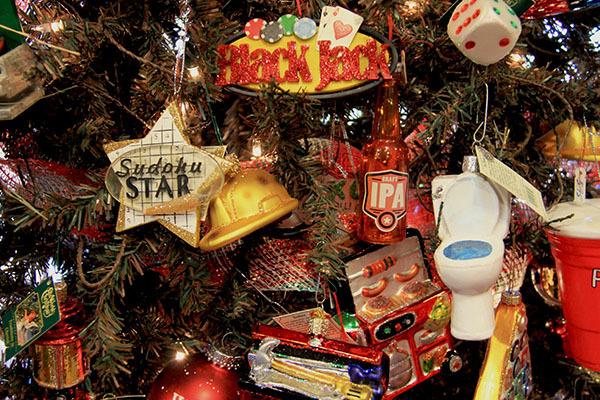 Her ornament themes and categories are impressive: from sudoku and poker to hunting and ballet, there’s an ornament to fit almost anyone’s favorite hobby, and you’d be hard pressed to find a pursuit not represented on one of Mistletoe’s trees. The shop’s charm is evident even as you walk out the door with a purchase. As a way to pay the merriment forward, Sue and Heidi carefully adorn the handle of each customer’s shopping bag with an extra decoration for the tree. Borrowed from the Louisiana French custom of “lagniappe,” this “little something extra” thanks shoppers for their patronage. Leaving the store and returning to the reality of mid-July, it’s comforting to know that holiday spirit is shining brightly and available in Door County any time of year.